On Friday the world was shocked by the extremely brutal attack on the Muslim mosque in Al-Arish Egypt. At least 305 lost their lives and over 125 others were wounded as 25-30 terrorists armed with automatic machine guns stormed the premises in several vehicles, taking up positions in the front of the mosque and at its entrances. From those vantage points, they unleashed the most brutal terrorist attack in Egypt’s modern history. Why would Muslim Arabs go into a mosque and brutally murder over 310 other Muslim Arabs as they prayed? To begin to understand, one must understand the religious underpinnings of the opposing Muslim groups involved in this incident. Inside the mosque was a congregation of Sufi Muslims, known to be very conservative and non-violent, spreading a message of love, harmony and unity. There is some evidence they believe in a personal relationship with God (though they do not seem to accept Jesus). But, I thought ISIS was losing the battle! Indeed, that is what we’ve heard on the news, and it is true to a degree. Other forces (good and bad!) are taking back cities and other strongholds of ISIS in Syria and Iraq. Many ISIS warriors are fleeing back to their countries of origin, where they enter easily because they have passports allowing their return, and where they unleash “lone wolf” attacks! However, those who haven’t fled home have grouped up in desert areas, where they are most productive. Their MO: flash into a city or small village, do damage, and scatter back out into the desert. What’s being done to stop them? Egypt’s President responded forcefully to the attack in Al-Arish. A high-ranking General before becoming President, el-Sisi is not afraid of calling upon a strong military to launch F-16’s or other deadly weaponry. Indeed, the Egyptian military took out a terrorist outpost with an airstrike following the terrorist attack. The problem is this: fighting terrorists isn’t a conventional war. Warplanes and tanks are not efficient at taking out a scattering band of terrorists in the deserts of Sinai. Thus, like many other nations learning to fight terrorism, Egypt is turning to the experts: Israel! Never has cooperation been so high between Israel and several of their Arab neighbors. (Among them: Egypt, Jordan, Saudi Arabia, United Arab Emirates) But as mentioned in a previous post, this should not be surprising to those of us who understand our Bible! We know that, when Gog of Magog (Russia) leads the Ezekiel 38 coalition against Israel, it will not include those nations recognized as friendly to Israel! Again, we see sides being taken that align precisely with what Scripture tells us they will be when the Northern Invasion takes place. BTW – Christians stand with Egypt, and so does Israel! 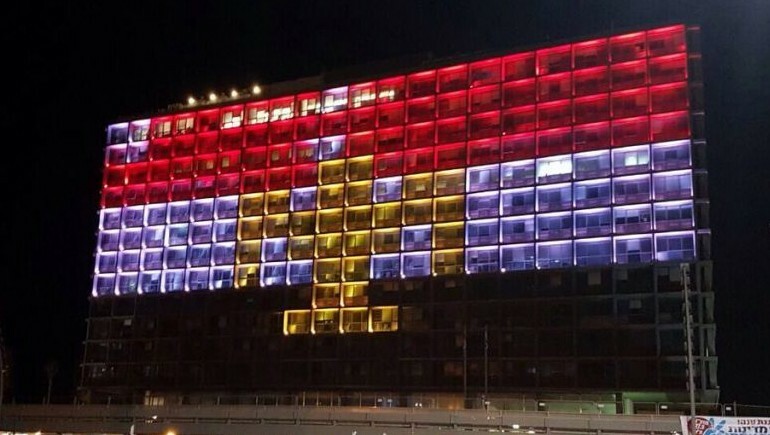 Tel Aviv City Hall lit up as the Egyptian flag.